When we think of great periods of flowering in the arts, we, as westerners, usually think of the European Renaissance or the Baroque periods, or Ancient Greece. I think it is very important that we understand that many non-western cultures have had flowerings in art and culture equal to or surpassing that of the European Renaissance. One such culture was the Safavid Dynasty that ruled Persia (Iran) from 1502 to 1736. The reign of Shah Abbas I in Iran (1588–1629) is considered one of the greatest periods in the Safavid dynasty. Abbas reclaimed much land taken by the Ottoman Turks, including Baghdad, and moved the capital to Isfahan. He monopolized the silk trade through Iran and used the profits to initiate a building program and patronage of the arts previously unseen in Iran. Book painting became less important in Iran towards the beginning of the seventeenth century. Single-page works of art became increasingly popular, because lavishly illustrated books tended to be extremely expensive. 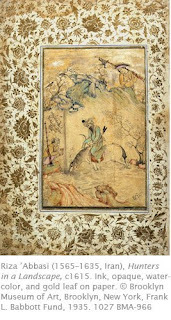 Riza Abbasi was one of the masters of single page compositions, and one of the first Iranian artists to prefer such works over book illustration. Trained by his father Ali Asgarh, Abbasi worked in the court workshop of Shah Abbas as a young man. In 1603, he was given the honorific of “Abbasi,” meaning “of Abbas.” Shortly thereafter, he left the court workshop. According to contemporary accounts, Riza was temperamental and preferred the company of the common people to courtiers. However, he rejoined the royal workshop in 1610 and remained until his death. This work is typical of Abbasi’s style. Figures are elegant, composed of fluid and graceful lines. Color is applied in a semi-transparent, almost impressionistic manner that recalls Chinese landscapes with their suggestion of form. Chinese painting had been influential in Iranian painting starting in the 16th century. Abbasi’s style had a great impact on all subsequent Iranian painting. Unlike many of his contemporaries, Abbasi’s work does not display any overt influence from western art. This link shows you more examples of Iranian painting. Connections Across Curriculum - The Silk Road was mentioned in the first post of this blog for its link between Greek and Buddhist art. It is interesting to see that 1,500 years later trade routes between the east and west continued to have a major influence in commerce and art. Although it had declined, the Silk Road experienced a revival during the Safavid Dynasty, especially as the empire was positioned to trade with European and Asian powers. Today, we make connections between the east and west through foreign relations, the media, the internet, commerce, and many other outlets. How are these connections felt in our daily lives? How can art mediate these experiences?